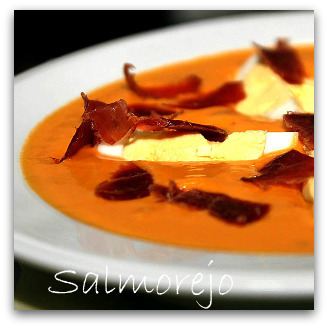 I remember the first time I tasted Salmorejo when I first arrived in southern Spain – as a tapa in Neptuno Beach Club, Mojacar Playa. The intense tomato taste just blew me away. 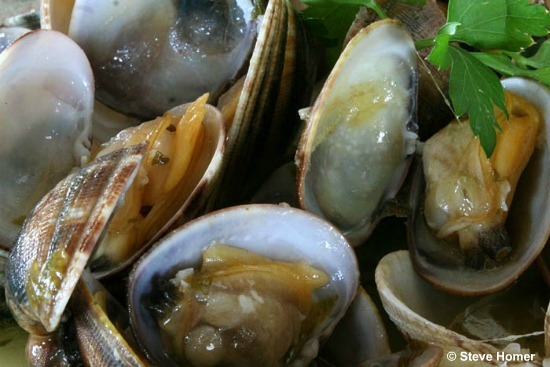 This is a classical dish from Cordoba but it is widely served in Almeria Province and is considered ‘an Andalucian classic’. Personally I prefer it to the much adored Gazpacho and I would certainly offer this tapa in competition to any Gazpacho I have ever tasted. My preference is for Salmorejo to be thin rather than thick. The thinner version gives it a more refined feel, and smoother taste, very up-market! 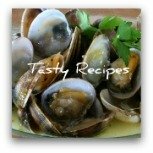 This is a great dish to serve to guests at a dinner party, and served in Martini cocktail glasses it just looks stunning too. 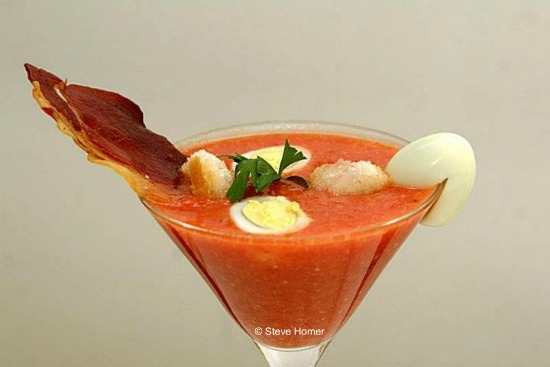 The Photo: This Salmorejo was prepared by a traditional Spanish chef, Pepe Ramos was slightly thicker than to my liking. Notice the use of a quail egg on the side to garnish. Also, a pinch of flat leave parsley gives it a colourful look. 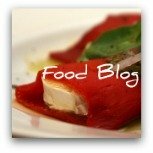 It is usually served with Serrano ham and chopped eggs but I have seen a wide variety of different ways to serve it and restaurants are now competing in how best to present this dish…with garlic cream foam, with anchovies or with the classic ham and eggs. 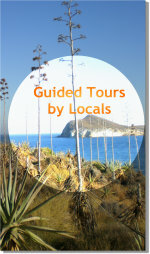 Don’t forget in Spain we use quails eggs, as they are so readily available and inexpensive. 1 stale * bread baguette (the quantity of bread varies according to the thickness you wish to achieve). *dry bread – in Spain one day old – in the UK say 2 or 3 days old but not mouldy. You also need a food processor or a processor stick (I prefer to use a magi-mix processor as I can just leave it to run for however long it requires and get on with other things. Also, because I prefer this dish thinner, I don’t have to stand over the machine to monitor the consistency). Remove the crust from the bread using a sharp kitchen knife. Skin the tomatoes – you can decide to deseed the tomatoes if you wish – I prefer to deseed them but it is not compulsory – indeed many people just core the tomatoes and leave the skins on, but that gives a more course finished product as the skins never really break-down (see: How to skin a tomato). Place the tomatoes in the food processor with the oil, vinegar, garlic and a little salt (you can also add the egg yolks from the hard boiled eggs if you wish). 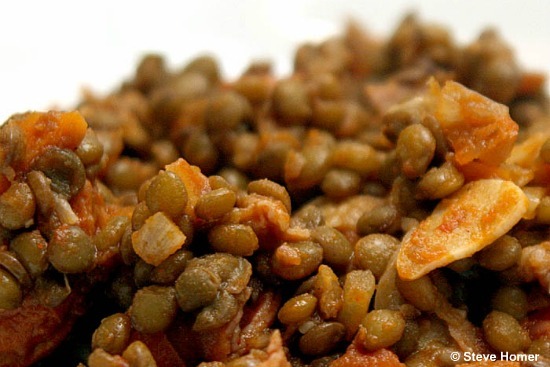 Blend this all together and then start to add the stale bread bit by bit. Note: The mixture will very quickly become thicker and as you add the bread it will take longer for it to mix through. Continue adding the bread and processing until you achieve the desired consistency for your liking. Note: You may not need to add all the bread or you may need a bit more. 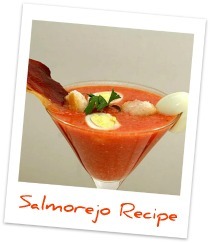 Tip: Pour the Salmorejo mixture into a bowl and chill in the fridge for about 2 to 3 hours. 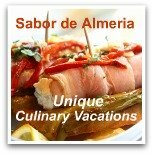 An interesting tasting tip is to try a spoon of salmorejo before you place it in the fridge. Usually you can taste the oil – then after the chilling process you will taste a much more refined dish where the oil has taken time to blend. To serve: Pour into soup bowls or in my case a Martini Cocktail glass and garnish with finely chopped eggs and Serrano ham. The skinning planning process takes place even before you reach the kitchen! 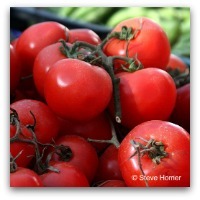 Whilst at the market choose ripe tomatoes, not those that need to ripen, and not those that are overly squashy. The idea here is, depending upon their use in whichever recipe, to use ripe tomatoes whereby the skins will peel off easily, but the tomato can remain firm. For a salsa the firmer the better but for a Salmorejo then the firmness of the tomato is less important. In the end opposite the tomato core, place a small neat cross in the top with a sharp knife. Plunge the tomatoes in turn into a pre-prepared saucepan of boiling water using a slotted spoon – blanche the tomatoes for approximately 30 seconds. Transfer the tomatoes into ice-cold water for about 30 to 60 seconds. Remove from the cold water and tear the skin off using your fingers, from the pre-cut cross. The skins will easily peel. Repeat the process until all the required tomatoes are skinned.